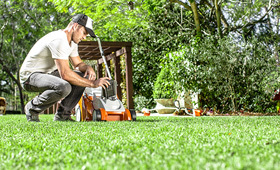 Give your lawn the care and attention it deserves with STIHL battery lawn mowers. Utilising STIHL Lithium-Ion batteries, eco-mode and efficient motors, STIHL mowers are ideal for small to large-sized lawns. Special high-lift blades ensure an attractive cutting pattern. The battery also fits a number of other STIHL battery tools. Mulching kits can be fitted to further improve the condition of your grass. Batteries and chargers sold separately.